Although your taste buds detect only four basic flavors — salty, sweet, bitter and sour — your sense of smell allows you to perceive a variety of more subtle flavors. You identify specific tastes from the information your taste buds and olfactory sensors relay to your brain. Experiencing a metallic taste in the mouth is a taste abnormality disorder known as dysgeusia. While the condition has numerous causes, vitamins often play a role in the unpleasant taste. If your mouth tastes like metal for a few hours every time you take a multivitamin, it’s possible your supplement is responsible for the off-putting sensation. Multivitamins, particularly those that contain heavy metals like zinc, copper and chromium, have been known to cause a metallic aftertaste. The taste is usually temporary and typically subsides after the vitamin is processed by your digestive system. 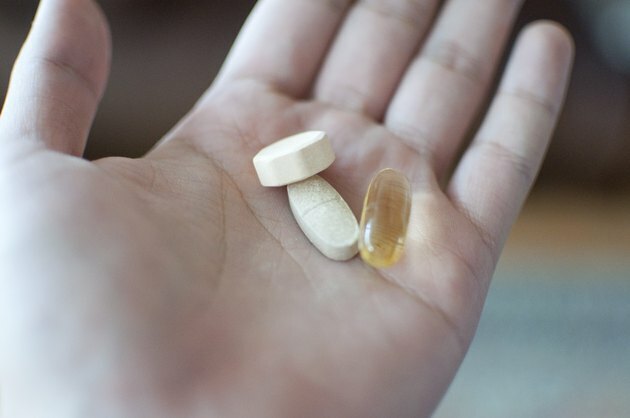 Watch out for poor-quality vitamins that may contain contaminants of heavy metals. These can cause symptoms including a metallic taste. Some herbal supplements related to the ancient Indian Ayurvedic practice, sold online through U.S. websites, may be unsafe. Researchers from Boston University School of Medicine found that nearly 21 percent of the Ayurvedic herbal supplements they tested contained lead, mercury or arsenic that exceeded acceptable standards. The study was published in the International Journal of Occupational and Environmental Health in 2015. Anemia is caused from an abnormally low red blood cell count in your body. If you suffer from anemia, you may have been prescribed an iron supplement, such as ferrous sulfate. This drug is often given intravenously, especially in children who have difficulty swallowing pills. The known side effects of receiving iron by IV include a metallic or coppery taste in addition to dizziness, fast heartbeat, tingling of the hands or feet and other symptoms, according to the Women's and Children's Hospital in Australia. These may disappear once your body adjusts to the dietary supplement. The National Institutes of Health says zinc deficiency, rare in the United States, can be caused by certain factors, such as poor diet. One of the roles of zinc in the body is to help with your sense of taste and smell. If you have a zinc deficiency, you may experience symptoms that include metallic off-taste in your mouth, according to the UK's Whittington Hospital. A vitamin D supplement may be necessary for those with certain disorders or medical conditions, for expectant or postmenopausal women or for elderly people who can’t get the benefit of sunshine. Although rare, megadoses of vitamin D can cause toxicity — hypervitaminosis D — warns Mayo Clinic. This condition causes a buildup of calcium in your blood leading to symptoms including metallic taste, frequent urination and nausea. Your body needs vitamin B12 for healthy nerve tissue, brain function and red blood cell production. But if you're not getting adequate intake of vitamin B12 from food, you might experience a strange taste. In an interview for "The Sunday Express," Dr. Andrew Well, from Harvard Medical School, claimed that a metallic taste in the mouth is a common complaint and may be caused by not getting enough vitamin B12 in your diet. He stated that some people lose their sense of taste with insufficient vitamin B12. Your body needs magnesium for regulating muscle and nerve function, blood sugar levels and blood pressure. If you need a supplement, such as magnesium citrate, it's good to know that very few people experience a metallic taste from magnesium supplements. eHealthMe, a data analysis company that compiles reports from FDA information, claimed that results of a five-year study of 1,713 people taking magnesium citrate found that only five people experienced a metallic taste. Mayo Clinic: What Is Vitamin D Toxicity, and Should I Sorry About It Since I take Supplements? The Sunday Express: Vitamin B12 Deficiency Warning - Can You Taste This Strange Flavour in Your Mouth?